It's been over a year since I read The Girl of Fire and Thorns and I still think about it all the time! I absolutely cannot wait for the sequel, which comes out TOMORROW! You can win the first book here, but you should buy the second book ASAP! Some of the things I love about Girl of Fire and Thorns are the YA "barriers" that you break down. When writing did you write these with the intention of being different? Have there been any unforeseen consequences? Thank you! Yes, my intention was to be different. I love epic quest fantasy with the fire of thousand suns. But there are things about the genre that bug the crap out of me. One of them is the paucity of normal women. In high fantasy, women tend to be either improbably beautiful or improbably repulsive. I know so many young women in real life who are extraordinary, but not one whose singular defining quality is beauty--or ugliness. I decided I wanted to write a quest fantasy featuring a young woman who becomes extraordinary through her personal choices, just like so many of my real-life girlfriends. This was the ARC cover that caused a ton of buzz because it followed the same stereotypes that the book tried to break down. Your own life story is so interesting! I especially love how you knew you wanted to be a novelist, but tried to find something more "practical." What advice would you give to people in the same boat? People who want to be writers, but are afraid it won't make ends meet. My number one piece of advice is this: Don't punish yourself for not being able to pursue your dream every day. These are tough times for a lot of people, and practical considerations have to win out. It's a hard, cold reality. So don't feel guilty, don't get down on yourself; just do what you can. Having said that, it takes a lot of hard work to become a published author no matter what your circumstances. So my number two piece of advice is this: Do take every reasonable opportunity to practice your craft. 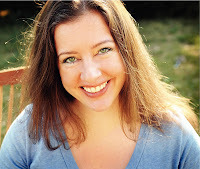 When I got serious, I hung out with a group of about 10 or so aspiring authors. We wrote, we critiqued, we revised--for years. A few gave up. Of those who didn't, every single one is now published. 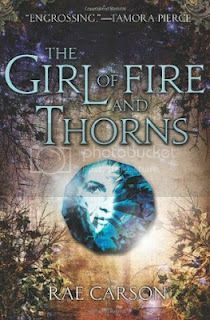 Would you want to live in the world of The Girl of Fire and Thorns as yourself (not as a character)? Why or why not? I'm a wimp. I wouldn't last a week in that hot desert. But there are a couple of gorgeous tropical islands introduced in book 2, The Crown of Embers. Palm trees! White sand beaches! Bioluminescing bay! Who wouldn't want to live in paradise? Do you think The Rules would allow me to bring my own Mai-Tais from this world? I love the German with all my heart. I think it does the best job of capturing the mood and tone of the book, and its bright colors will make it stand out on shelves. In the U.S., though, that cover would be considered too "young" for its intended audience, so it will be interesting to see how it fares in a different cultural market. Do you have something you regularly overuse when you write? (Parenthetical statements, commas, etc. [those are mine, can you tell?]) Or any other writing ticks? Things that get edited out before the book goes to print? Oh, dear, should I confess? I suppose I must… But yes. My characters tend to speak "softly" to each other. Sooo much soft speaking. With softness. Once, I did an edit/replace and changed "softly" to "big green boogers" just so they'd stand out in my manuscript. It forced me to evaluate each one in a new context, and I ended up deleting most of them! And just for fun: what's your opinion on arachnids? I used to live in a house infested with black widows. I kept a kill count on my blog. I even posted pictures. (Behind a cut, don't worry. You're welcome.) The one good thing to come of that harrowing experience is I became desensitized to spiders. And while arachnids and I will never be bff's, I no longer scream in terror to see them. By the way, there are lots of arachnids in book 3. The jock strap slopes upward as we furry deeper into the sandstorm. Here the tiara stretch higher with viscous lines, slothful curtains. Occasionally, pony flashes against real hadron collider. With the change in slime mold, I expect my new home to be swollen and shimmering. I have wanted to read this FOREVER. Love this, The Girl of Fire and Thorns was one of my favorite books I read last year. Love your questions for Rae (not just the same old same old thanks!) and cannot wait to crack open Crown of Embers! Awesome post. 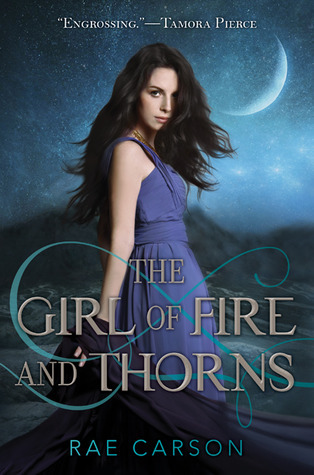 And I love the cover of the ARC of The Girl of Fire and Thorns. Big green boogers - hilarious! I enjoyed this one, but I've read so many books since that I can't remember it very well. I'll have to reread before I take on the second one. I have nothing intelligent to say. I think it is too early for me to be brilliant. Hahaha! Enjoyed the interview. Looking forward to reading these books. I have wanted to read this for forever! Eeek! Scary spiders! Great interview! Rae Carson interview! Yay! Loved The Girl of Fire and Thorns! Looking forward to The Crown of Embers! lol love this post! 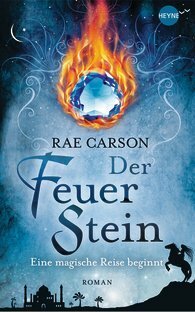 I really like the German cover for The Girl of Fire and Thorns! Loved this book and can't wait for the second! I loved how it was so different from other YA books in many ways. Loved this book and am dying to read Crown of Embers. Thanks for another great interview! I'M SO EXCITED TO READ THIS BOOK!!!!! Rae's much braver than I could ever be....I don't think I.could ever get used to living with spiders. I'll have to sell that house! I also read the book over a.year ago but now ur making me excited to reread it! I haven't read this one yet, but it is nice that it's about a normal girl who becomes extraordinary. It gives the rest of us ordinaries some hope! Heeeey, that's pretty cool! Big green boogers, black widows in her house, not lasting a week in a desert... She seems pretty awesome! :) I have to say, after going to camp, I am not as afraid of giants bugs as I used to be. In fact, I laughed when I saw a silver bug in our bathroom. Nothing compared to giant moths the size of my hand. No joke. The book sounds cool from this interview. I LOVE LOVE LOVE the Girl of Fire and Thorns! I cannot wait for the Crown of Embers! New favorite author. For real. I love this interview. I also love you Enna. In a non-creepy, completely straight kind of way. I'm so jealous of you! 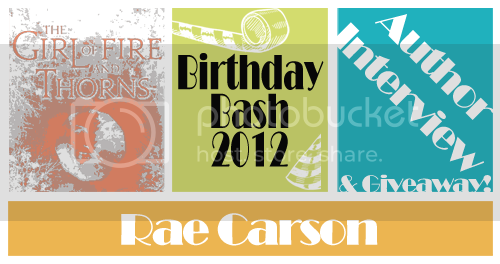 You got to interview the very much genius Rae Carson, who I'd love to meet. I can't wait to read The Crown of Embers!!! I read this as an ebook and LOVED it! I loved how it didn't fit into the typical book stereotypes. 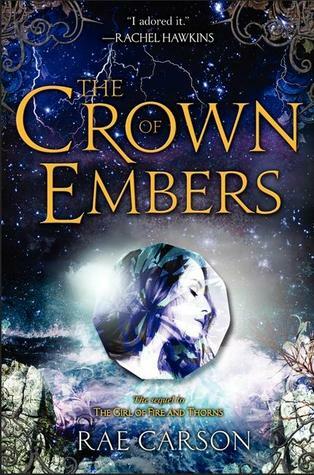 I can't wait to read The Crown of Embers, the cover is gorgeous! I'm dying to read The Girl of Fire and thorns, but I'm currenly in a buying ban trying to finish the never ending TBR pile. I've heard so much about the book! I'm dying to read it! What great advice. It think it can be translated over to other careers and parts of life as well! I haven't read this book yet! It looks great! The cover for this book is beautiful and the book looks great. I haven't read this one yet, but really enjoyed the interview. It's always interesting to hear an authoris opinion on something like the covers of their books. And wouldn't it be funny to hear someone replace "um" or "like" with big green boogers in a speech??? If you want to be published you can't give up. A good lesson there. Interesting about the covers. Big green boogers!lol That is hilarious!I have been wanting to reading this series since it came out. I'm looking forward to reading it even more now! Awesome interview! I've been dying to read this book! I haven't read The Girl of Fire and Thorns yet, but I'm excited to! Love the different covers!